The Yaesu FT-50R is manufactured to rigid commercial grade standards, and is the first dual band handheld amateur radio to achieve the prestigious MIL-STD-810 rating. Use Dual Watch to select any frequency combination and the FT-50R automatically switches channels for instant operation. Plus, the built-in digital battery voltage feature can be used to monitor current operating battery voltage. Plus the FT-50R is the first dual band HT to include Digital Coded Squelch (DCS), super loud audio, and the "widest" band receive allowable. In fact, the FT-50R is the smallest 5-Watt dual band with wide band receive. The FT-50R is rugged, reasonably priced, simple to operate and has all the features you want. FT-50R super wide receives: 76-200 MHz (VHF), 300-540 MHz (UHF) and 590-999 MHz (less cellular). This HT includes 3 user-selectable filters: AM aircraft receive, FM narrow and FM wide. There is a 12 VDC Input Jack on the left side. Estimating the value of a rig can be challenging. 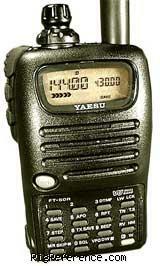 We collect prices paid by real hams over the years to help you estimate the current value of the Yaesu FT-50R. Just bought or sold this model? Let us know what you traded it for and help other ham operators!